Redesigning a website can be a huge struggle for any business. It takes a lot of resources to redesign a website, and with the amount of work involved your marketing team will likely be pushed to their limits. Typically, a website redesign will require around three months of concentrated effort. That’s three months of your marketing team focusing their attention away from your brand’s recurring marketing efforts. Pulling away the main focus of your marketing team for such large stretches can be potentially harmful for your business. Thankfully there’s a faster more efficient method that can be used. This method is called growth driven design and it can truly transform the way you approach website design for your business forever. Growth driven design (GDD) is an adaptive web design and digital marketing model. The core components of GDD are test, learn and adapt. 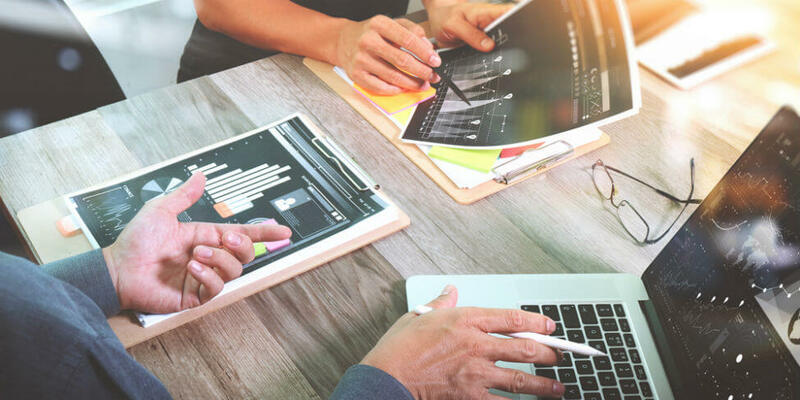 The growth driven design methodology minimizes various risks commonly associated with traditional website design by focusing on meaningful data that reduces the time it takes to launch your site. In essence, GDD is a combination of marketing and design where the two goals are fused together to become one. How Does the Growth Driven Design Methodology Work? Growth driven website design is an ongoing process that leverages collected data (such as customer behavior on your website) in concert with continuous learning and constant testing to make strategic and impactful performance improvements to your website. Data driven web design calls for shorter planning which allows it to be accomplished in shorter amounts of time. This is a safer and more effective method of web design, and it ultimately saves the user money. The problem with traditional web redesign is that it can take three months or more to gather the data needed to make the proper design changes. This data includes usability testing, content audits, consideration of budget and so on. The beauty of data driven website design is it doesn’t take up all the time and collective effort of your marketing team because it integrates itself with both marketing and sales. Analyzing the behaviors of site traffic can help both your marketing and sales team improve the way they go about accomplishing their goals and can help them improve the tactics and strategies they need to be successful. You could say it takes two phases to build a data driven website. The first phase is the strategy and launching phase. This will last around one month. The second phase is the development and continuous improvement phase. This phase will be continuously in use for the following eleven months. The following three steps will help you execute the first phase of data driven website design. To begin, you should formulate your strategy and form goals so you have an idea of what you’re trying to accomplish. Next, create buyer personas to find out who your ideal client base is. This will also help you identify what customers care about and what they like, which will allow you to create an effective marketing strategy. Once you’ve finished the above step, you will move on to a detailed website audit. You’ll analyze where your customers are coming from, your average bounce rate and how users interact with your site (amongst other analytics). Analyzing the above data should ultimately allow you to discover the pain points of your visitors which in turn will allow you to improve the overall user experience on your website. The goal of your website audit is to learn the behaviors of your visitors and why they perform specific actions. You can then act on that information and make improvements. The final part of the first phase is to create a wish list of everything you would like on your website that would improve the overall user experience. This can include an updated home page menu, implementing SEO for your About Us page, simplified navigation, additional pages, new calls to action, etc. Create a list where you gather both the changes you absolutely need for your website and the changes you’d like to make onto your website. As you proceed, you can begin moving the less pressing items further down the list which you’ll eventually target later in the 11-month cycle. Through this process of elimination, you’ll eventually figure out where your website’s true strengths and weaknesses lie. The first stage takes place over the course of a month. The second phase will continuously be in use for the next 11 months. As opposed to redesigning a traditional website your full attention should be on the actions of your visitors. Your visitors should be at the forefront of your mind with every update, new feature, and new strategy you implement on your data driven website. During this phase, you’ll constantly be analyzing your site’s performance on a month to month basis and comparing it to your overall goals for the site redesign. From the data you obtain, you can determine the goal’s that need to be accomplished in the future. Working with the appropriate business units in your business (marketing, sales, etc.) you will create the tasks needed to improve your site based on user feedback. You will then create a marketing campaign to direct targeted traffic to your new and improved pages. Implement validation tracking codes to continuously track the metrics on your site so you can continue to make improvements by gathering additional data. As you split test and experiment with improvements you’ll find that certain assumptions you’ve made, such as adding “more intuitive” navigation to your site to improve user experience, may not be what your data driven website needs after all. Therefore, you can throw that idea out and replace it with something that directly benefits your users. Perhaps you’ve identified that your website redesign SEO strategy will be more beneficial to focus on in the immediate future. The final step is to transfer the data you’ve gathered to your marketing team. Your team can then proceed to use that data to improve their ability to locate and attract your ideal customer. There are numerous data driven website advantages you can enjoy if you go about the process correctly. Data driven web design is all about improving your website in small, meaningful chunks until you create the ultimate user experience. You should always be analyzing data to make future improvements. At MARION, we know what it takes to build and continuously manage a growth driven website. Marion is a full-service marketing firm that offers highly rated custom website design services. We build every website with the client’s brand and bottom line in mind. Our experienced team has helped hundreds of industry-leading brands build effective websites that have grown their businesses, and we can do the same for you. Contact MARION today for help with building a data driven website for your business. Jay Ferranti brings lengthy experience to solving problems for customers through design and programming. Out of necessity, Jay designed and built his first website in 1998. Since then he’s continuously worked in this field while adapting to myriad changes as they happen. When not working, Jay pursues other passions including art and music, and is an avid cat lover.